Samsung today announced the Galaxy S8 and S8+, its flagship smartphones for 2017. The phones marry aluminum frames to curved glass panels as they adopt what Samsung calls its Infinity Display. The Infinity Display moves from the industry standard 16:9 aspect ratio to a taller 18.5:9 ratio with 2,960 by 1,440 pixels. The devices share nearly all features other than size and battery capacity. Where the S8 has a 5.8-inch display and 3,000mAh battery, the S8+ boasts a massive 6.2-inch screen and 3,500mAh battery. 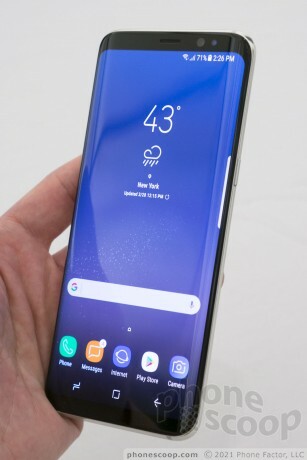 The phones see Samsung drop the physical home button that has long adorned the front of its handsets in favor of on-screen controls and a virtual home button that's unmarked in the area below the screen. This allowed Samsung to reduce bezels along the top, sides, and bottom edges, meaning the front is 83% display. Samsung says the displays are mobile HDR certified and offer more room for multitasking. Core features include Snapdragon 835 processors with 4 GB of RAM, 64 GB of storage, and support for memory cards. The phones are rated IP68 for protection against water and dust. They include rear-mounted fingerprint readers, front-mounted iris scanners, as well as wireless and rapid charging. The main camera has a 12-megapixel sensor with optical image stabilization and an aperture of f/1.7. The front camera has an 8-megapixel sensor and also an aperture of f/1.7 with autofocus and face detection. Ports include USB-C and 3.5mm headphone jack. The Galaxy S8 and S8+ run Android 7 Nougat with Samsung's new Bixby voice-enabled user interface, as well as improved Samsung Health, Samsung Connect, and Samsung Knox apps. The U.S. version will come in black, silver, or purple. The phone is expected to go on sale next month. Pricing will be set by carriers.